I was at the doctor’s office last week and had a chance to actually flip through magazines that I never have time to read, and look what I found! 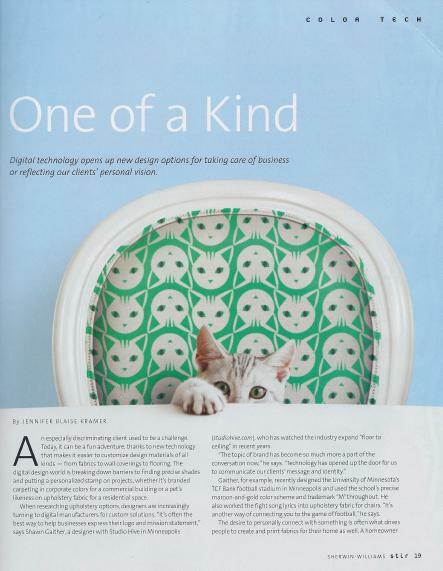 In Sherwin Williams’ Stir Magazine was an article about how more and more designers are turning to digital manufacturers to provide custom solutions for their clients. I thought this article was so cool I had to share it! Digital manufacturing of fabrics and wallpapers adds a personal touch when the subject matter is close to the homeowners’ heart. Pets are a great example. There aren’t many (if any) fabrics or wallpapers out there with multiple breeds of dog & cat options and many that do exist tend to look very traditional and often do not have multiple colorways to choose from. However, with digital manufacturing you can customize your fabric design and colors so that your specific furry friend (or anything that you want to capture) can be portrayed in a myriad of ways–funky, fun, whimsical, colorful–the possibilities are limited only by your imagination. One website that has thrived off of this idea of custom fabrics and wall coverings is spoonflower.com. Spoonflower is a fabric website where anyone can create their own pattern and have it printed on their choice of fabrics. Whether you like to make quilts, clothing or want to reupholster a sofa, spoonflower has the options you are looking for. It’s really quite revolutionary and adds a bit of unexpected whimsy to a room’s decor. 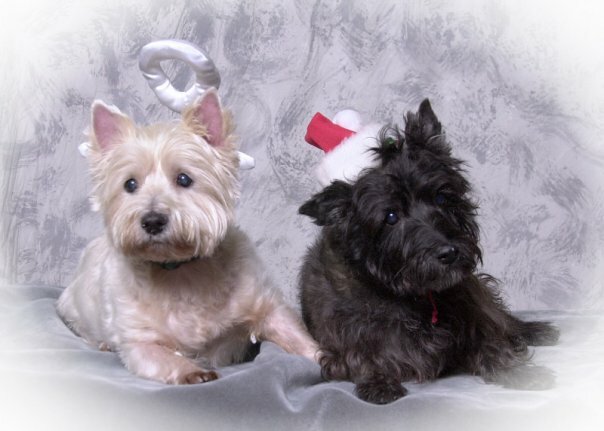 My last two dogs Brandi (a Westie) and Scottie (a Cairn Terrier, aka Toto) lived to be 15 and 17 respectively, and were cared for probably better than most humans are as they aged. 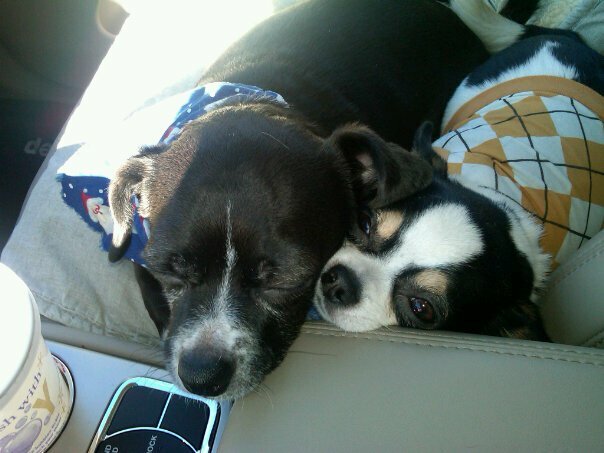 Once they both passed on, I decided to volunteer for Lucky Dog Animal Rescue and became the foster mom for Jake (a Chug–a Chihuahua/Pug mix) and Edward (an adorable little Chihuahua)…and yes I failed twice as a foster because once they were in my home, I had to adopt them. In the dog rescue world we call that a Failed Foster Times Two! I figured, hey, if I have to fail at something in life I can’t think of anything better to fail at, can you? The reason I’m telling you all this is because the author of the article used pets as his example to demonstrate how your beloved Rover can be replicated in a fabric of your choice. So naturally, given my love for my furry companions, I had to read on and share what I learned. Ok, I digress, but wanted you to fully appreciate how important animals and pets are in my life so that you could understand why I was so excited when I saw this article about how to take your pet’s photo and transform it into a fabric or wallpaper. 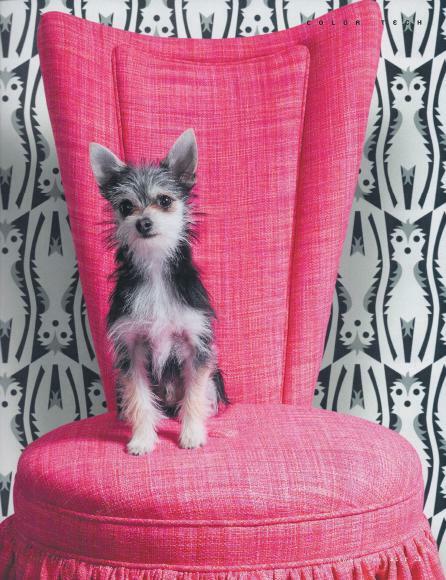 One of the examples in the article, shown below, is a black, white and gray wallpaper inspired by a terrier. 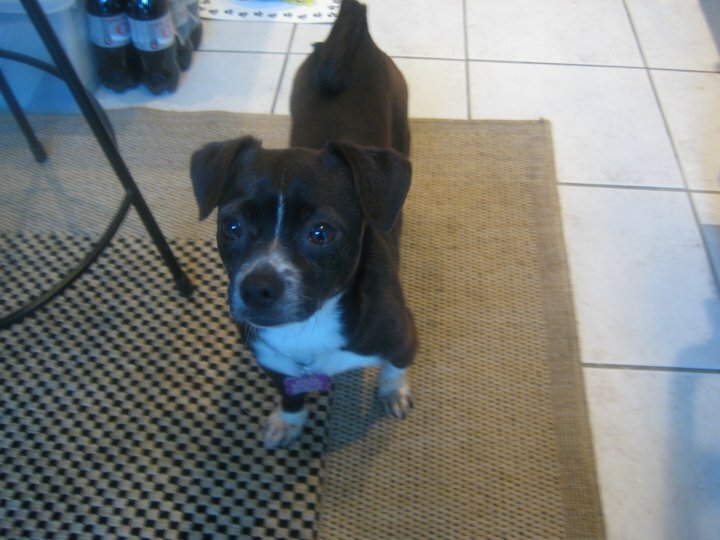 Could you capture this pooch any better? I hope this post has inspired you to think of memorializing your pet and infusing his or her likeness into your home’s decor in a fun and interesting way. If you decide to create your own fabric or wall covering, please do share! I would love to see what you come up with. Happy Decorating!